Another Saramago book! This one I didn't pick up for any particular reason...I found a copy in the discount books section at my independent bookstore so I bought it. One of the aspects of Saramago's writing I love is his ability to expand on a notion, pulling on threads to see where they go, even (especially!) if they lead to a only marginally related tangent. Not everyone will be a fan of this style. I know I wouldn't tolerate it, this chasing after every little thing and expanding on minute irrelevant details, unless it was done well - I find Saramago is one of those writers who can pull it off. Now that I've typed it out, perhaps this is actually a better example of showing and telling. Saramago shows us the tie is left on and tells us why, but both of those points combine into a larger instance of showing something about Tertuliano's character. This is what I like. I enjoyed the inclusion of Tertuliano's common sense as a character who crops up every now and then, adding something a little different and unique to the story, giving it a bit more flavour. (I didn't mark it, but a piece of dialogue between the two made me laugh: Tertuliano: Well, I will see you later, Common Sense: Oh, I doubt it). Last point: I read a review on Goodreads that compared Saramago to Haruki Murakami, another one of my favourite authors. I don't think I would have noticed the similarity if someone had not suggested it, but I think I would agree. The story is relatively mundane, with the extraordinary being handled in a very ordinary way. Notably, this review made the comparison in a disparaging manner, arguing that Saramago merely replaced Murakami's tropes with his own. I wouldn't think so. 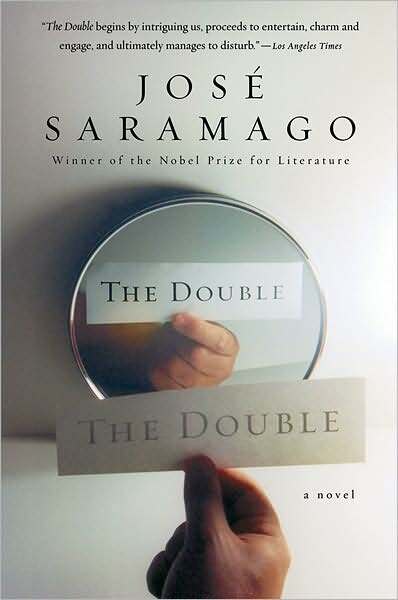 Saramago has a very distinct style and I think this sort of story fits with what he writes - it doesn't seem out of character or like he was trying something different. The story felt naturally Saramago; similarities to Murakami being coincidence. That being said, I think the two (Murakami's overall body of work and Saramago's The Double) are rather similar in how I felt about the plot - a bit dry and dull and lengthy in the middle, with an exciting final 50 pages or so turning around how I felt about this book. Everything really came together towards the end and that's why I'm giving this book 3.5 instead of 2.5. If you manage to stick with it (though I wouldn't blame you if you didn't), then it is a good read!